In this month’s inaugural Life in Beta column I wrote about how the Internet can enable our natural generosity. 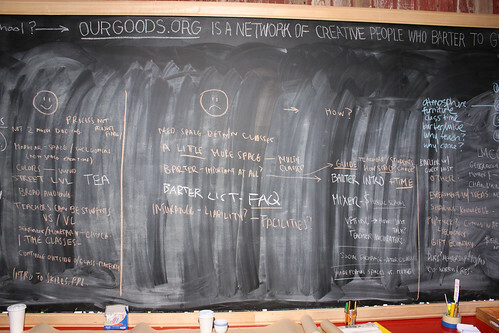 Caroline Woolard, a visual artist who manages a cooperative artists’ space, is putting this insight into her life’s work for the creative community with OurGoods.org, a site that enables artists to barter space, material, and services, and Trade School, a cross between a 1960s “free school” and a performance art piece, currently running in New York City’s NoLiTa neighborhood. Q. What is your background–educational and work and avocational? Q. How did you get the idea for Ourgoods? 1) How can we facilitate a stronger, more sustainable network of cultural producers? question, “How can artists get more resources? for everyone, and the more value is created. Q. How does the site work? Q. When did you launch? how have the responses been so far? that’s where we live and that’s where we’ve been organizing events. did you get the space? What are some things going on at the school? had a lot of potential. Q. Why do you think there’s so much energy right now around sharing and barter and peer-to-peer practices? satisfy far more than practical needs. Q. What are some resources (books, people, parties, websites, blogs) that inspire you around sharing and generosity? A. This summer, I found out about an international movement: The Solidarity Economy. I am now working with the Solidarity Economy’s NY branch as the Community Outreach volunteer. Beyond that, I’m inspired by Community Economies and also list more here.